There is a lot to admire about Singapore's long standing determination to develop its knowledge economy and propel its scientific institutions to global leadership. When a decision is made to invest, they go for it, with world class expertise and funding. Chris Hogue pointed me at this announcement of a 10 year, $150 M committment to cutting edge biology. I've said it before, Singapore is a great place to be in the science business. National University of Singapore (NUS) - A global university centred in Asia. A new Mechanobiology Research Centre of Excellence (RCE), which will work on new ways of studying diseases through the mechanisms of cell and tissue mechanics, will be set up at NUS. It will receive a funding of $150 million over 10 years from the National Research Foundation and the Ministry of Education. The Mechanobiology RCE will be NUS’ third Research Centre of Excellence following two other RCEs - the Centre for Quantum Technologies and Cancer Science Institute of Singapore. Led by Director-designate Prof Michael Sheetz from the Department of Biological Sciences at Columbia University and co-Director-designate Prof Paul Matsudaira, Head of the NUS Department of Biological Sciences, the centre will have three integrated inter-disciplinary teams working on cellular, molecular and tissue mechanics. The researchers will endeavour to develop powerful quantitative physical and biochemical models to define dynamic cellular functions, experimental reagents and tools for studying diseases of cells and tissues. See, this is why I love biosciences. Take some pigs, mix'em with jellyfish, and you get Day-Glow Porky. Very cool. If you read the article you get to the medical benefits of glowing tissues (can track them in vivo, etc. blah blah). But that's pretty boring next to the idea of a pig you can read by. 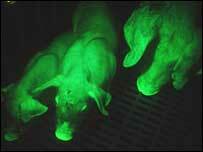 BBC NEWS: Taiwan breeds green-glowing pigs Th-th-th-that's all folks!